Have your prospects book a meeting with the correct person in your team based on rules you setup. All prospects from a specific account should book a meeting with the account owner. If a prospect belongs to an account of a specific size round robin to a group of people. If a lead comes from a specific region, assign to region owner. You can combine all your rules together. If the lead/contact already exists in Salesforce, the meeting is created in Salesforce and attached to the correct object. The meeting is automatically created in the assignees calendar and the prospect gets invited. The assignee receives an email with a link to the prospect in Salesforce. The meeting is displayed in the prospect calendars. You can create advanced rules and send your prospect an email, reminders before the meeting and much more. If the prospect doesn’t book a meeting, assign the lead to a Salesforce queue. Learn how you can build this router via Chili Piper or use your existing forms to route them to your team’s calendars instead. 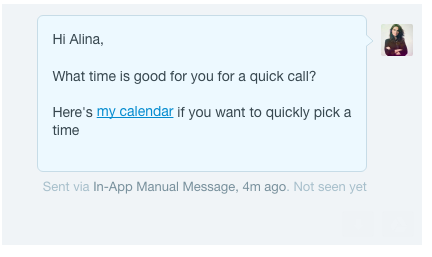 With Intercom, you can send targeted messages that are triggered by time or behavior. Within this messages, you can send specific calendars URL to your prospects that can drastically increase your conversion rates because prospects can book meetings in one click. Based on who the prospect is, they can book a meeting in one click with the correct person. You can get very advanced with your booking links before you send them out.